While this is the first “immersive” convention that I have attended, I have been a character performer at renaissance faires for 28 years. 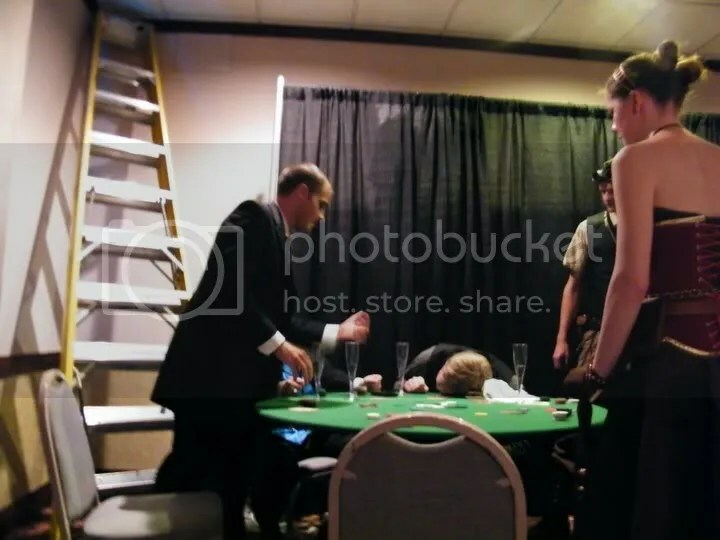 I have also worked on interactive mystery events at SF conventions before, so I had a very clear idea of what I was getting myself into. The script was originally conceived by Joseph Vorteque and then reworked for an environmental setting by Bill Dunbar, who also played the Captain in our scenario. I’ve worked with Bill quite a lot in the past, and he knew I had a lot of experience in this field, so when he ran the script past me a few weeks ago I proposed Kitty James the reporter as an audience POV character. No matter how much people want to follow the plot in an event like this, there is always going to be someone in the bathroom or eating lunch when something important happens, so having someone whose entire job is to keep the audience informed and engaged is critical. There also has to be a way for people to get up to speed on the things that they missed, which is where the idea for the ship’s newspaper came about. I wrote most of the content prior to the convention but I was finishing Issue 4 at about 3AM on Sunday. Some of the characters were figures in the steampunk scene while others were professional performers. 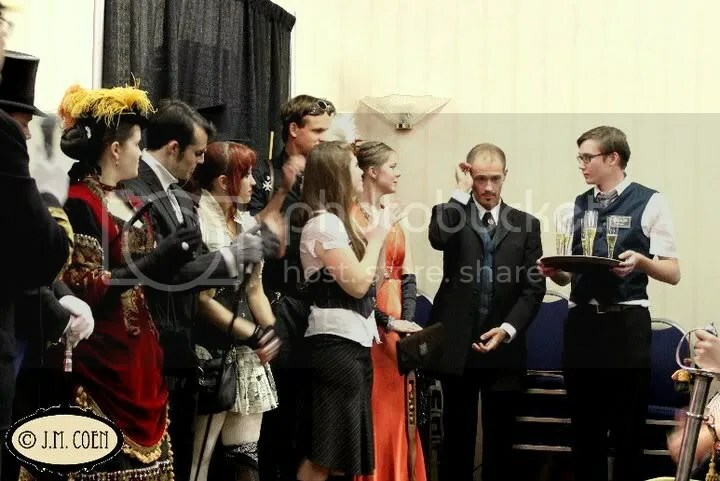 Many of them also had RenFaire experience, mostly because it’s one of the few places you can develop the specialized skills needed for this type of performance. The Duke and Duchess and many of the IAPS are fellow performers from the Michigan Faire in Flint. Others were local students of Eric’s brought in for the show. Coordinating so many people from so many places was a bit of a challenge. Due to a slip-up in communications, 6:30 arrived on Friday with no sign of the actor who was supposed to play Sr. Grebelle – the first victim who was to die during opening ceremonies at 7. We scoured the hallways for people we knew could handle it, and found a friend in the lobby. I asked him “Can you be French and die in half an hour?” His response was “Let me get a hat”. (After all, death is such a formal occasion). The original actor arrived shortly before 7, but was a good sport about things. Personally, I was pretty much in character the whole weekend. Aside from evening parties after the day’s scenes, I only was able to attend one panel. I’m pretty sure that the Captain didn’t either. As professionals we had a job to do, and while it was possible to break character and chat with a friend for a while we knew that we needed to get out there for the guests. This kind of thing can be a lot of fun but it also takes a lot of very hard work to pull it all together. When not “on stage,” we were usually revising bullet points, setting props and hanging backdrops, rehearsing with some fairly elaborate sound cues, or printing newspapers. 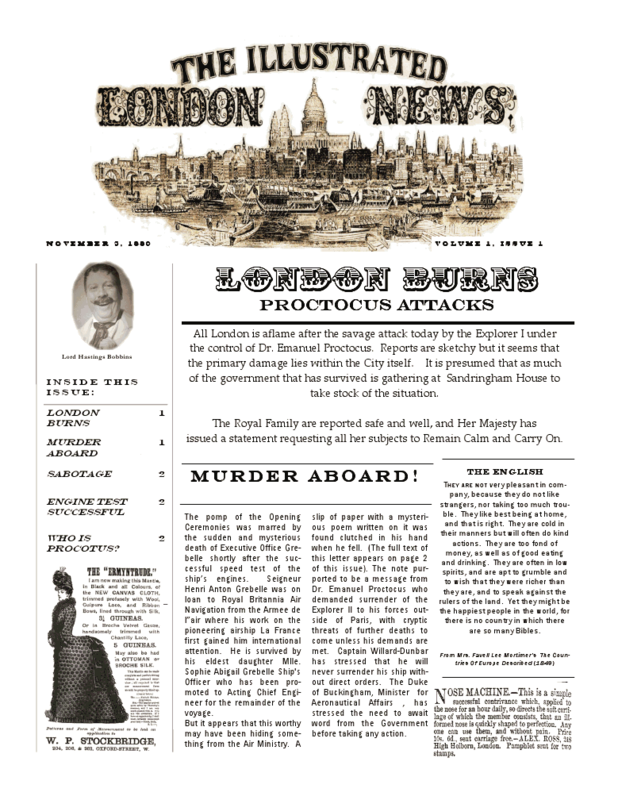 Elaborately produced daily newspapers kept attendees updated about the status of the mystery. Click for link to download copies at Steampunk Chicago. Since I’ve done several of these events before, I expected a high level of interaction and play with the attendees and I certainly wasn’t disappointed. When you have a hotel…I mean an airship… full of 400 terribly creative people, you can’t help but have a high level of interaction. People were coming up with the most amazing theories about the murders. 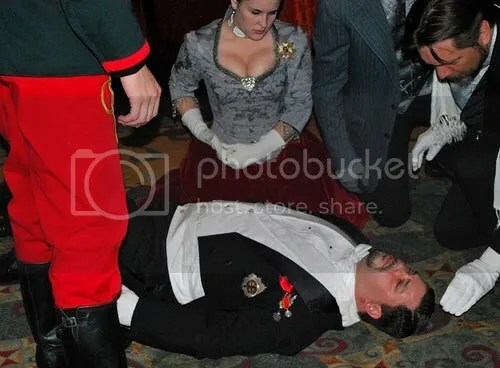 Two of Eric’s students named Griffin and Bauer were helping out the show as porters, and happened to be assigned to two of the murder scenes. There was a noticeable contingent of guests who therefore suspected them. (Of course, I had nothing whatsoever to do with this…) And when the poor boys went home, it was noticed that they had “disappeared”, and theories abounded as to who had thrown them from the stern somewhere over Switzerland! I think my favorite interaction of the weekend involved a terribly earnest young man who came up to me on Saturday afternoon. “You know how you said that we should find you if we see anything suspicious?” he said. “Well, I didn’t see anything exactly, but it certainly smells like something died in the mens’ room!” I actually did find someone in the hallway a few moments later who was dressed as an explorer, so I sent him in to investigate. A nose for news is one thing, but one can only be so dedicated. The Duke is Dead! Image courtesy of A.K. I do hope to return for Teslacon II. I will say that Bill and I already have a bid in to cast and write the mystery for it. We hope to eliminate some of the frazzleness that happened this year by keeping the actors as just characters and not having them running around covering panels. But in the end that is all up to Eric. TeslaCon is his vision, and it’s an epic one, and in the end the decisions are his to make. Wendy Zdrodowski is an actor, musician, and costumer based in Chicago IL. Currently she performs as part of Merry Measure (www.merrymeasure.com). 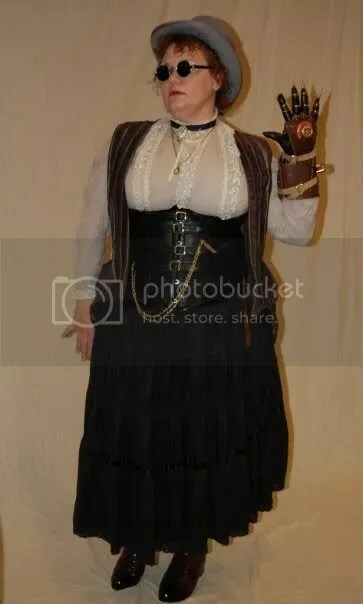 She is a contributor to SteampunkChicago.com and will be running the Masquerade and costume track at Windycon this weekend. Let me just say that you did a FABULOUS job. I knew that if I needed to know what on earth was going on, I could just look for Kitty James! Well done!